What Does a Dermatology Nurse Do? Where Do Dermatology Nurses Work? What Is a Dermatology Nurse? Dermatology nurses specialize in the treatment and care of a variety of skin diseases and conditions. Working in a wide range of settings, including hospitals, dermatology clinics and plastic surgeons' offices, dermatology nurses provide care for patients with psoriasis, skin cancer, burn wounds and acne among many other skin conditions. Dermatology nurses may also specialize in cosmetic dermatology, performing various procedures such as laser treatments and chemical peels. In order to become a dermatology nurse, students must first complete their Associate's Degree in Nursing or Bachelor of Science in Nursing degree and pass the NCLEX-RN exam. Registered nurses who want to specialize in dermatology may then work for a minimum of two years in dermatology before sitting for the Dermatology Nursing Certification Examination offered by the Dermatology Nurses' Association. To search and apply for current dermatology nurse positions, visit our job boards. What Are the Education Requirements for Dermatology Nurses? A position as a dermatology nurse requires an ADN or BSN degree in addition to an active RN license. Generally, an advanced degree is not required for dermatology nurses, but those interested in becoming a Dermatology Nurse Practitioner will need to complete a Master's of Science in Nursing degree. In addition to an active RN license, dermatology nurses may choose to attain the Dermatology Nursing Certification offered by the Dermatology Nurses' Association. Some dermatology nursing positions require RNs to hold the Dermatology Nursing Certification offered by the Dermatology Nurses' Association. While optional for many job openings, RNs who hold this certification will certainly have a competitive edge when applying for dermatology nursing positions. In order to sit for this exam, RNs must have an active RN license, two years nursing experience and 2,000 hours working the dermatology field. Dermatology nurses assist in the diagnosis and treatment of a variety of skin injuries and conditions, including burns, skin cancer, psoriasis, rosacea, warts, acne and impetigo among others. Dermatology nurses assist in the performance of skin exams, assess a patient's condition and record patients' medical history and test results. Often, dermatology nurses provide pre-operative and post-operative care for patients who have undergone various treatments and surgical procedures. Patient and caregiver education is also an important aspect of the dermatology nurse's job description. Dermatology nurses educate patients and their caregivers on how to care for skin conditions and recover from treatments once the patient has returned home. Dermatology nurses may also specialize in cosmetic procedures, such as laser treatments, chemical peels and microdermabrasion. What Are the Roles and Duties of a Dermatology Nurse? What Does a Dermatology Nurse Practitioner Do? Can a Registered Nurse Administer Laser Treatments? Can an RN Administer Botox Injections? What Kind of Advanced Training Can Dermatology Nurses Obtain? Dermatology nurses can expect a median salary of around $52,035. Geographical location, career length and experience level are all factors that may impact a dermatology nurse's salary. The dermatology field is a very large one, with a range of patient populations and a variety of conditions to treat, which creates a wealth of potential job opportunities for dermatology nurses. 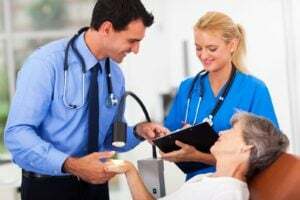 Additionally, an increase in skin cancer in the United States as well as advancements in cosmetic dermatology has resulted in a very positive career outlook for nurses interested in pursuing dermatology.